OTTAWA, ON (November 16, 2018): The Islamic State is crumbling, and in its wake, Canadian policy makers are now faced with a new challenge: what should be done with Canadian jihadis returning home or being detained abroad? 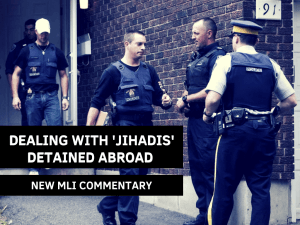 To address this problem, MLI has released a new commentary by Scott Newark, titled It’s Time for an Effective Strategy to Deal with Canadian ‘Jihadis’ Detained Abroad. In it, Newark argues in favour of a proactive, case-specific approach to managing jihadist fighters as they return to Canada or become detained abroad. But what should be done? After all, the crimes allegedly committed were far outside Canada, and there is little direct capacity for Canada to intervene. However, if Canadians are detained abroad and are mistreated, the Canadian government is left open to lawsuits on the grounds of Charter rights, as we have infamously seen in the cases of Maher Arar, Abdullah Almalki, Ahmad El-Maati and Muayyed Nureddin, and Omar Khadr. Newark makes the case that reforms are needed both in terms of how the government manages the return of jihadis and Islamic State supporters and in terms of working with foreign governments that have detained these individuals. In the event that local prosecution cannot be attained, the government should still attempt to arrange plea bargains wherein offenders are incarcerated upon their return to Canada. Ultimately, these reforms are based on the goal of defending the Canadian public. “It is essential to recognize and accept that the best way to prevent future harmful conduct by these people is to take appropriate action once they have been detected and apprehended,” writes Newark. To learn more about the actions that the government should take when it comes to Canadian jihadis abroad, read the full commentary here.